What if they gave a war and nobody came? Or: Is there anyone in the room who’s not in favor of world peace? Schell, the always distraught author of Fate of the Earth (1982) fame, seems to worry that, in the wake of September 11, plenty of his compatriots are ready to trash the planet to root out the perps, responding to an unstable and unfriendly world “by pursuing the anachronistic, Augustan path of empire.” Bad idea, Schell enjoins: a lot of people could get hurt, and indeed the whole world could be turned into a smoking husk if “just a few dozen of the world’s thirty thousand or so nuclear weapons” were somehow put to use. Instead, he urges, the way to get justice accomplished is to put the lessons of Gandhi and Martin Luther King Jr. to work: to resist evil through nonviolent means. Granted, the world would be a more just and lovely place if, instead of caving in to Osama bin Laden’s bunch, the Afghan people had “declined to do the will of the conqueror and, taking a further step, organized itself politically to conduct its own business”—but, as George Orwell once observed, people being beaten and bombed are more likely to do whatever it takes to stop their tormentors from causing further harm, including making a few accommodations. 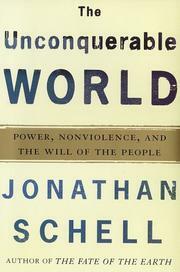 Schell is poetic, outraged, and always idealistic, and at times his arguments threaten to sway the skeptic—as when he offers a novel if highly selective reading of the American Revolution, arguing that nonviolent resistance was as important to the rebel cause as Washington’s cannons. Still, even the most starry-eyed reader is likely to wonder at the likelihood of America’s (or, for that matter, al-Qaeda’s) laying down arms just at the moment, or at the utility of confronting a Mohammed Atta with a daisy, or, indeed, whether the present state of affairs is really the path toward “annihilation,” or just an unfortunate blip on history’s radar screen. A hortatory blend of wishful thinking and old-fashioned one-world polemic: likely to convince only those already converted to the satyagraha cause.